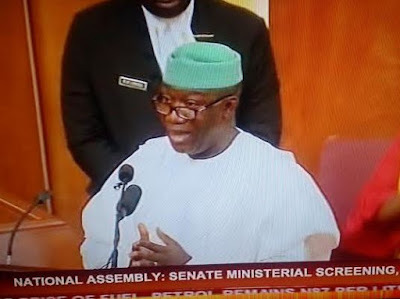 The Senate just finished screening Kayode Fayemi. During his screening, the former governor answered quite a number of questions. Reacting to claims that he left a heavy debt burden in his state while he was governor, Fayemi said he borrowed to offset debts owed by his predecessor, Segun Oni and also to develop infrastructures which he promised his people during his election. He said the debt figures being brandished around is false. Reacting to a question that he spent unwarranted sums of money to build a government house during his tenure as governor, Fayemi said he met a 2 bedroom apartment government house and so decided to build a befitting government house. He said the government house was a multipurpose house. He denied claims of buying a N50 million bed in the Ekiti state. He said there is even no N1.5 million bed in the Ekiti government house he built. He dared anyone to bring forward an invoice showing that he paid N50 million for any bed in the government house.